In Tokyo, the famous journalist Fumio Matsuo from Kyodo newspaper was invited by Ministry of Foreign Affairs of Japan to exchage with our class of external affairs officials on the situation in Asia. Through his memory, we highly appreciate his affection toward Vietnam for half a century. In his talk, and in his book "Democracy with a Gun", journalist Fumio Matsuo mentioned his story of becoming a permanent correspondent in the United States. In 1941, when Pearl Harbor was suddenly attacked by Japan, the US officially declared war on Japan. In April 1942, the first US aircraft raided Tokyo while Matsuo was in the third grade. In order to avoid Japanese air defense, 16 US B-25s were flying so low that one of them closely hit a two-story block in Matsuo's school. Through front glasses of the aircraft, Matsuo saw white face with big nose of a pilot. Then, so as to avoid bombs, the Matsuo family evacuated to their home town of Fukui. In the night of 19/7/1945, US aircrafts bombed the city of Fukui. 9,466 bombs destroyed 96% of the city's area, 1,784 civilians were killed, 6,039 were injured. Matsuo's house, 55 Teyosekami-cho was hit by a fire, the whole city was burning, the night sky was bright as day. 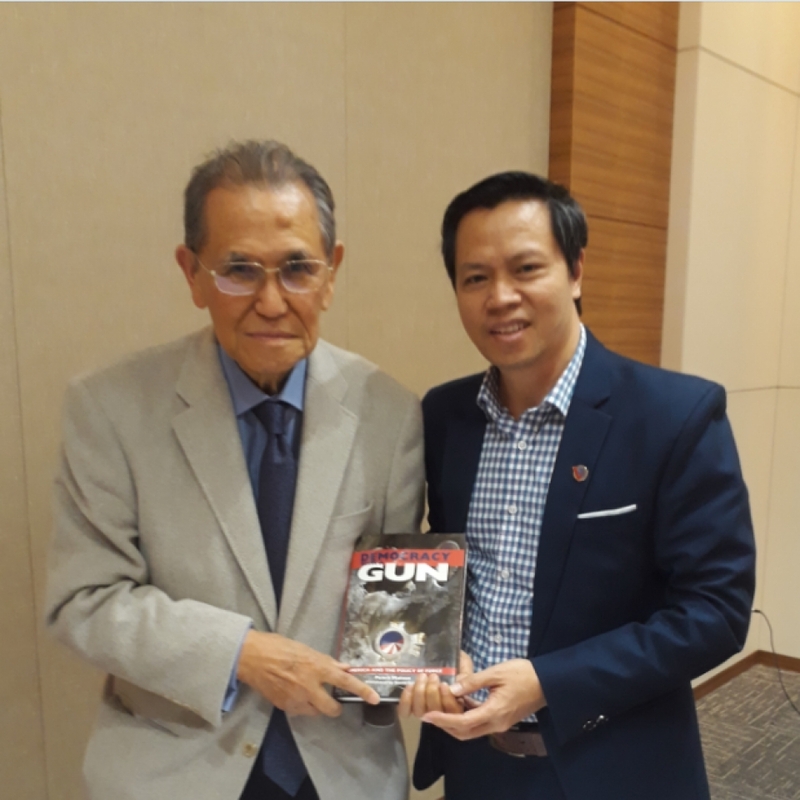 Journalist Matsuo (left) offered his book Democracy with a Gun to the author. "How is the United States ? ", "Why do we fight with the United States? ", "Why did we lose?" These questions and the image of his burning house urged Matsuo to go to the United States. In 1956, Matsuo joined Kyodo news agency. In December 1964, Matsuo first landed in the United States as a resident correspondent for Kyodo in New York. At that time, Lyndon Johnson was at the peak of his power, claiming "America is the world's policeman". The press could easily reach the White House. President Johnson often stayed up all night to think how to withdraw from the Vietnam War in honour. Matsuo and correspondents were very familiar with the image of a tall man with puffy eyes due to lack of sleep but still willing to answer the press. To save honour of his nation, Johnson tried to hide from the press the quagmire situation of the US troops in the guerrilla war in South Vietnam. But the number of American casualties had had increased in the United States which started anti-war movement in the U.S.
As a victim from the US bombardment on Japan, journalist Matsuo was very sympathetic to the anti-war movement. On November 6, 1965, Matsuo covered an anti-war rally at New York's Union Square. There are five American young men took the stage one after another to deliver anti-war speeches and then burnt their draft cards. The protest group sang "We Shall Overcome”. Sound of the song mixed with the smoke from draft card burning covered the square. Five young men were arrested but authorities could not silence public opinion. Flame of the burning of draft cards activated another battle in the United States: the anti-Vietnam war movement with the draft card burning broke out everywhere . From 1972 to 1975, Kyodo news assigned journalist Matsuo to be in charge of Indochina war news from his base in Bangkok, Thailand. On 29/3/1973, at Tan Son Nhat airport, Matsuo witnessed the event of US withdrawal from South Vietnam. Matsuo showed us a black and white photograph in which he stood near a Vietnamese reporter checking a camera. He was probably the correspondent of the Vietnam News Agency. Matsuo does not know where the Vietnamese reporter is now, but what happened in that day was as clear as yesterday. 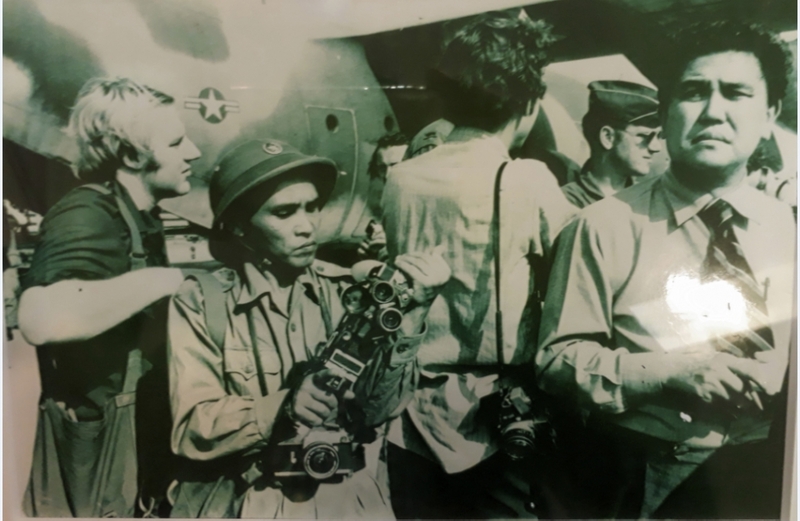 Journalist Matsuo (right) at Tan Son Nhat Airport, 1973. In the express article sent back to his headquarters of Kyodo in Tokyo "A Dreary Deactivation Ceremony in Saigon", journalist Matsuo wrote these lines: Before depating for Hawaii, General Weyand, the last commander of the US Military Assistance Command Vietnam, delivered a farewell speech in Vietnamese to Army Chief of Staff Cao Van Vien and other senior South Vietnamese government officials. Although he emphasized the completion of the US mission and an expectation for a continuation of honorable peace, his speech was met by only moderate applause and the polite but unemotional smiles typical of the Vietnamese. 8 military officers from North Vietnam and the Provisional Revolutionary Government of South Vietnam were monitoring the US military got in aircraft C-141. Colonel Nguyen Sinh, representing Provisional Revolutionary Government of South Vietnam, said: "This is a new beginning for our people. lthough there will be many difficulties, we have to build a true reconciliation among our race from this point forward”. Then the North Vietnamese military officers and the Provisional Revolutionary Government of South Vietnam smiled and talked to the American soldiers, saying "Let’s stop fighting. Now is the time for friendship". The last US soldiers to leave were presented picture postcards of President Ho Chi Minh and some rattan handicrafts. Col. Nguyen Sinh was right, peace was not really easy to obtain after the US withdrawal under the Paris Agreement. It took 2 years, in April 1975, the Saigon regime completely collapsed. Kyodo news agency was the first agency to publish this news. Returning to the story in 1973, after he reported the event at Tan Son Nhat Airport, journalist Matsuo traveled along the coastal Highway 1 from Saigon to the Quang Tri river in the Demilitarized Zone to cover the exchange of prisoners between North and South of Vietnam. Along the way, he saw the flag of the National Front for the Liberation of South Vietnam flying over many villages. An impression that Matsuo never forget to witness the Republic of South Vietnam returning prisoners of war to the North at the Thach Han River. When the boat was at the midst of the river, the soldiers jumped into the river and swam to the North bank, not waiting for the boat to take them. Now, when recalling those images, Matsuo told that he really admired the intelligence and strength of the Vietnamese troops. That is why they are the winners. When Matsuo was at the Tan Son Nhat airport to write the report to Tokyo about the withdrawal of US forces from Vietnam, he really wished the words of Colonel Nguyen Sinh soon become a reality. He was looking forward to North - South Vietnam union like the way he sincerely tried to heal Japan - US relations throughout his career. In his years as a correspondent in the United States, Matsuo tried to find the identity of the American pilot who dropped the bomb in Tokyo when he was in 3rd grade. Luckily, Matsuo found him. He was Richard Cole, an assistant. In addition, he found out the other man sat on that plane that day is Lieutenant Colonel James Doolittle, commanding a fleet of 16 units raided Tokyo in 1942. After a quick attack warning Japan, the whole fleet of the Doolittle could not returned. Among them, some sacrificed, some were captured as prisoners, some were lucky when falling into the Soviet Union or North China. The Japanese then scanned whole the area and killed the Chinese for hiding American pilots. Decades later, the 3rd grade student who escaped from American bombs became the permanent journalist in America, and the American pilots on that day now was an old man. Cole wondered whether Matsuo was hurt in bombings that year. Stepping out of the worst war of all time, the Americans remember the pain of being beaten in Pearl Harbor, and the Japanese can not forget the national disaster by two atomic bombs. "Why do we fight the Americans? ", Matsuo’s question is also the question of people in Japan and in America "Why are we fighting?". Same as Cole and Matsuo, people of the two countries have set aside their past to look forward to the future. Matsuo said, at the age of 83, he wrote a book after witnessing events most desirable of his life: In May 2016, the U.S President Barack Obama has done historic visit to Hiroshima, where American atomic bombing causing 14,000 Japanese deaths; and in December 2020, Japanese Prime Minister Shinzo Abe visited Pearl Harbor, where 2,400 Americans were killed when Japan hit this naval base. Through his book, he wanted to make balancing solution from historical factors. He expected the next generations in the two countries to live in peace, not take their whole lifetime to find the answer for question "Why do we fight ?". The lessons learned from the Paris Peace Accords can still be applied today, according to former Vice President Nguyen Thi Binh. Is your privacy violated when you are “a citizen of the Facebook Kingdom”?